Leo Varadkar has said an Irish woman arrested in Syria and her two-year-old son have the right to return to the Republic of Ireland. The taoiseach (Irish PM) said that removing their Irish citizenship would not be right or compassionate. 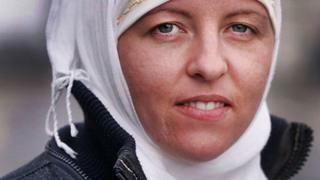 Lisa Smith, 37, from Dundalk, was reportedly radicalised and travelled to Syria eight years ago. Irish Justice Minister Charlie Flanagan indicated that she was unlikely to be arrested upon her return. Former soldier Lisa Smith joined the Irish army and air corps after leaving school. She worked on the government jet and accompanied the former president Mary McAleese and the former taoiseach Bertie Ahern on journeys. Mr Ahern remembers her as a "lovely lady", who loved her job and who was always engaged and interested. Eight years ago, in an interview with the Irish Independent newspaper about the time she converted to Islam, she described herself as a former party girl who drank too much on occasion, smoked cannabis and took ecstasy. She said she realised there had to be more to life and after exploring spirituality she decided Islam was for her. She said she left the air corps because as a Muslim woman her role was to be a wife and a mother. She married but her marriage quickly broke down and, in 2015, it is understood, she travelled to Syria after being radicalised online. There she married a British fighter and had her child. Within the last week she was identified from an ITN video from a refugee camp where ISIS families were being housed. Covered by a burka and speaking with an Irish accent she was described as a British woman. An Garda Síochána (the Irish police) were alerted and they approached her family in Dundalk. Unlike the case of Shamina Begum in the UK, Lisa Smith is unlikely to have her citizenship revoked. While Britain has experienced ISIS-inspired terrorism, Ireland has not. The Department of Foreign Affairs in Dublin has said it has yet to be asked for consular assistance. Mr Varadkar has said it is a very serious thing to make someone stateless adding that every country should take responsibility for their own citizens rather than passing it on to some other country. Each case of someone returning from ISIS territory will be examined on its own individual merits. The Dublin authorities have indicated that a suspected ISIS fighter, who grew up in Belarus, but who is now an Irish citizen, can return home. Aleksander Bekmirzaev, who denies being a fighter, is being held in a Kurdish camp.